5. LeFou’s Brew – Gaston’s Tavern – Fantasyland in the Magic Kingdom brings some of the worlds of favorite Disney animated films to life including Beauty and the Beast. Guests can wander through the village from the film and even enter into the Beast’s Castle to enjoy a meal at Be Our Guest Restaurant. In addition to the delicious options at that location, guests can also order up quick service meals and snacks throughout each day at Gaston’s Tavern. From giant Cinnamon Rolls to savory sandwiches, Gaston’s Tavern is a wonderful option to enjoy while in the Magic Kingdom. 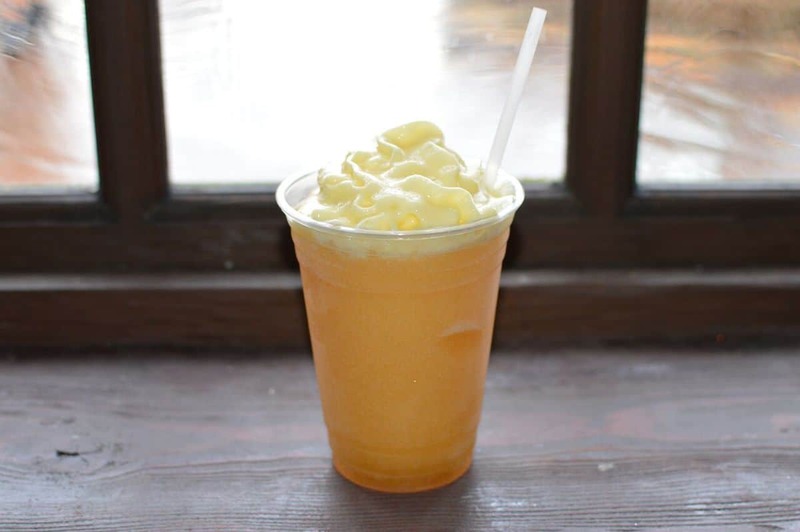 Guests who stop there will especially love sipping on LeFou’s Brew which is frozen apple juice with notes of toasted marshmallow topped with Passion Fruit-Mango Foam. Guests can order this sweet and unique beverage in either a regular cup or a souvenir cup that looks just like one that Gaston himself might drink out of!